It seems that the euro has suffered from too much negative in the recent times. The EUR/USD rate has been falling down for five out of six consecutive trading days. It would seem that the pair should have been drawn to the bottom border of the consolidation range of 1.1265-1.1485 because of disappointing data on German industrial production, the GDP forecast revised down by the European Commission, the resumed political risks and the talks about a failure in the US-China trade negotiations. But the Euro won’t give up without a fight. The forecast for the euro-area GDP growth has been revised down due to a slowdown in the Chinese economy, vulnerability of emerging markets and the turmoil in the financial markets, potential harm of Brexit and tightening of the US fiscal policy. The EC expects the euro-area economy to expand by 1.3% and by 1.6% in the 2019-2020 periods, however, in November, it announced the growth rates at 1.9% and 1.7%. The worst decline should face the GDP rates in Germany (-0.7 %) and Italy (-1%). The latter economy, according to the EU, should expand by just 0.2% in the current year. 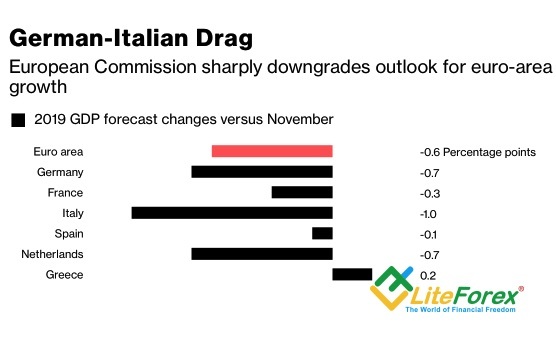 The optimistic forecasts of anti-euro officials in Rome seem to be far from reality, which encourages investors to get rid of the local bonds. 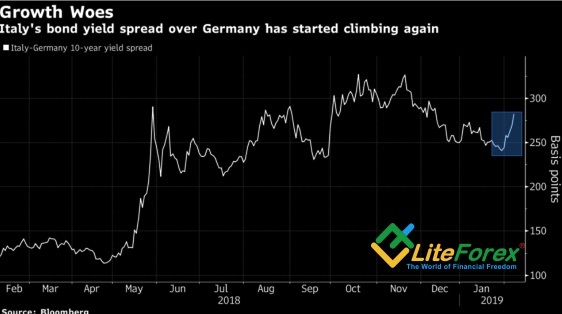 The Italy-Germany 10-year yield spread is rising, indicating the resumed political risks. Trade wars pressed down the domestic demand and became one of the factors of decline in the euro-area GDP pace in 2018. With this regard, the talks about a lack of progress in the US-China trade negotiations came as another blow to the euro. According to the US president’s top adviser Larry Kudlow, much work remains before the U.S. and China reach a trade agreement. Donald Trump is not willing to meet with Xi Jinping before March 1, although, he used to say that the agreement could be signed only by the leaders of the two countries. According to the Institute of International Finance, the markets overestimate the possibility of a compromise, which is expressed in unjustified strengthening of yuan. In fact, the tariffs are currently more likely to be retained than to be canceled. The EUR/USD bears have been held back by James Bullard dovish comments that the federal funds rate shouldn’t rise any more, as well as by the consensus forecast of 62 Wall Street Journal Wall Street Journal experts about a decline in the US GDP growth down to 2% in the first quarter. In fact, the St. Louis Fed President is the most dovish FOMC member, and the House Budget Committee and Morgan Stanley suggest even worse outlook for the US growth pace at 1.8% and at 1.7%. Frankly speaking, I don’t yet see that the euro should rebound from the previously suggested support level at $1.133. If the euro-area economy is that weak, the Italy soon reminds of itself, the Brexit creates troubles and the trade wars resume, the EUR/USDwill certainly slide down much deeper. The euro outlook seems to be too pessimistic, doesn’t it? ...a Signals Support Provider partner of Forex Lite Africa, Africa's number 1 forex provisioning and business partner of Liteforex. FFInv seeks to support forex users (newbies and professionals), providing them with signals and information that help them make the right decision for optimal business. Sign up to receive updates and the latests news about Firm Fountain Investments. We respect your privacy and we don't spam. I can make profit in demo account but I am in loss in real account! Why? How can we make profit from a real account?